Wacissa, FL--The weather forecast for May 22, 2009, called for a 70% chance of heavy thunderstorms and that looked bad for the annual Memorial Day weekend scheduled for the Wa cissa. The weather scared off Tristan Shelfer, Katie Peterson, Donald and Gloria May, and Greg Baker from making the paddle, although Greg and the Mays did appear to help eat supper. Donald was also kind enough to run the shuttle so that paddling could commence once the group arrived at the head spring. Keith Webb brought a truckload of Stines relatives down from North Carolina--W.H. Stines, Calvin Stines, Wendy Jo Stines, Noah Stines, Ray Dean Webb, Karen Webb, and Todd Webb, as well as two Jack Russell dogs, Duke and Dottie. Art Shelfer, John Williams, Janice Shelfer, and Jeanne Hewetson all spent the nights at Janice’s hideaway, Shiloh, and actually arrived on time. Denis Wafula, a doctoral student at FAMU who is from Kenya, made his rookie voyage. It was also the rookie voyage for Wendy Jo and the maiden Fellow Traveler voyage for Byron’s hand-built cedar strip canoe and for Ray Dean’s Souris River Quetico 17 canoe which he rescued sunken in the Boundary Waters. Diane and Charlie Stines came and brought Diane’s Yorkie, Ami. The paddle was underway at nine. No one was late. Byron took Denis as his partner. The weather was nice despite the stormy forecast. The first part of the trip was through the spring area. There were a lot of wading birds including a limpkin. No hawks, eagles, or osprey were seen on the entire trip. The first stop was at the Big Blue Spring. This is about a mile below the head spring and is a large spring which is about forty-five deep at the vent. Lots of fish were visible in the clear waters. From there the group paddled toward Cedar Island. A few stopped but most did not. Some went to the left of the island and others went to the left. There were several alligators, all small ones, and lots of turtles, some enormous. 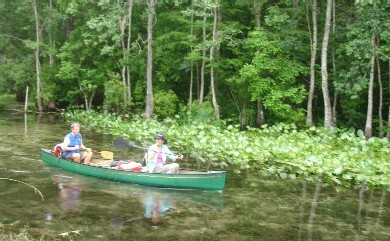 The paddlers crossed the remnants of the old Wacissa dam and tram about noon. Still there was no rain. A nice breeze cooled the air but there were no strong headwinds. After crossing the dam the river divides into many smaller fingers and many are canopied. It was a very pretty day and the spring colors were great. Wildflowers were everywhere, and Diane especially liked the numerous spider lilies. Around lunch time everyone stopped for lunch on the river. 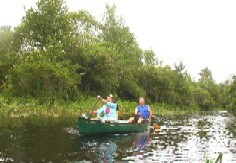 The canoes were paddled into an area or river grasses an the usual gourmet snacks were devoured. John brought along some really good grapes which he generously shared with others. T he last mile to Goose Pasture is what Diane calls the doldrums. It is a trail through grass where the scenery is not outstanding. There were a lot of gallinules and some ducks. Goose Pasture came into sight shortly after one and the lady game warden met the gang. She checked for life vests (everyone had one) and for whistles (only Charlie had one) so she issued warnings for those without whistles. She decilined the invitation to join the travelers for a fried turkey supper. Donald and W.H. had gone ahead and secured the group campsite. It is a good site with a large picnic shelter and a smelly porta-john. Charlie slipped and fell into the water but no real damage was done. 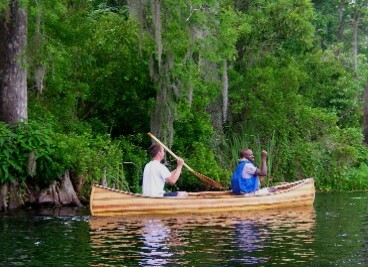 Everyone got out of the canoes and began swatting mosquitoes. Donald took the drivers back to the head spring to retrieve the vehicles and get some more ice from J.R.’s Store near the Aucilla. Once the drivers arrived camp was set up. Art brought his fogger and treated the area for mosquitoes. Those who had Thermacell repellant devices still appreciated them. 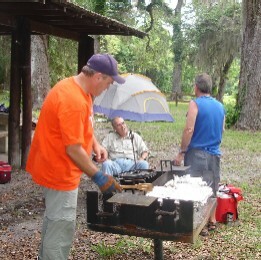 Greg arrived shortly afterward, and then Bill and Doneice Honeycutt came from Deltona. with their dog, Abby. Art and Charlie were to fry the turkeys but there was a problem. In spite of being out of the freezer for thirty-six hours both turkeys were still frozen solid. Jeanne suggested that they be steamed in the friers using water and it did work. They were fried to perfection and then fried a little more beyond perfection. It was a real feast. Donald brought coleslaw, Greg brought bread, Jeanne made a delicious sweet potato casserole, John steamed vegetables in his Dutch oven, Keith made a blackberry cobbler in his Dutch oven, and John cooked a peach cobbler in his. Ray Dean churned ice cream. Everyone had more than enough to eat. Greg and Denis did not spend the night. After supper the campers sat under the shed and shared stories but there were no new notable lies told. Byron and Noah built a nice campfire and several sat around until bedtime. It did come a gentle rain during the night but everyone stayed dry. The King made forty cups of coffee before breakfast. John baked biscuits in the Dutch ovens, Charlie made grits, W.H. cooked sausage, and John scrambled the fresh free-range eggs Ray Dean and Karen had gathered from their North Carolina farm. 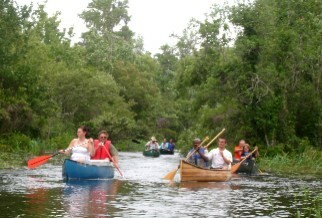 No one wanted to canoe the slave canal so everyone began breaking camp and packing the cars. The trip out was marked by Charlie’s not turning onto Powell Hammock Road and ending up on a dirt road which was blocked by a gate. Ray Dean turned the Exhibition and trailer around because there was not a prayer that Charlie could accomplish that himself. But Keith’s crew just drove around the gate and met up with Charlie and Diane at J.R.’s Store. A couple of young alligators ran across the road and naturally Ray Dean and Calvin tried to catch one of them, thankfully unsuccessfully. Everyone went home after a great trip. The group was reminded of Don Meece’s wisdom--the Weaherman has spoiled a lot more trips than the weather has. It truly was a fine outing.